I receive several “daily quotes” on my home page….here’s a special one from today…. This entry was posted in Compassion and tagged Compassion, Life, Meditation, Mindfulness, Spirituality. Bookmark the permalink. what a beautiful healing prayer. I am holding it in my heart. Everytime I read that prayer, my heart feels like it’s bursting with yearning for those healing changes… this image with this prayer on it is on several of our walls and right near the head of our bed…it’s so beautiful. marvelous that it is somewhere that you walk by and see it. Not to mention the healing energies it sends into the room where it is. precious thought eh? This is so beautiful – thank you so much for sharing. I immediately shared this on my Facebook timeline! This prayer just really covers all the areas that we allow to disturb our own peace. We need to simply BE WITH and REST IN the solutions–compassion, service, love, warmth, attentiveness. yes….a wonderful philosophy that is shared by many…I think that the DalaiLama is a truly remarkable person…I’m amazed by his very busy travel and teaching schedule…in addition to many hours every day of meditation and helping the Tibetan people…but I guess his deep commitment to compassion and helping others energizes him and makes that possible. Thanks for the link to these beautiful words. 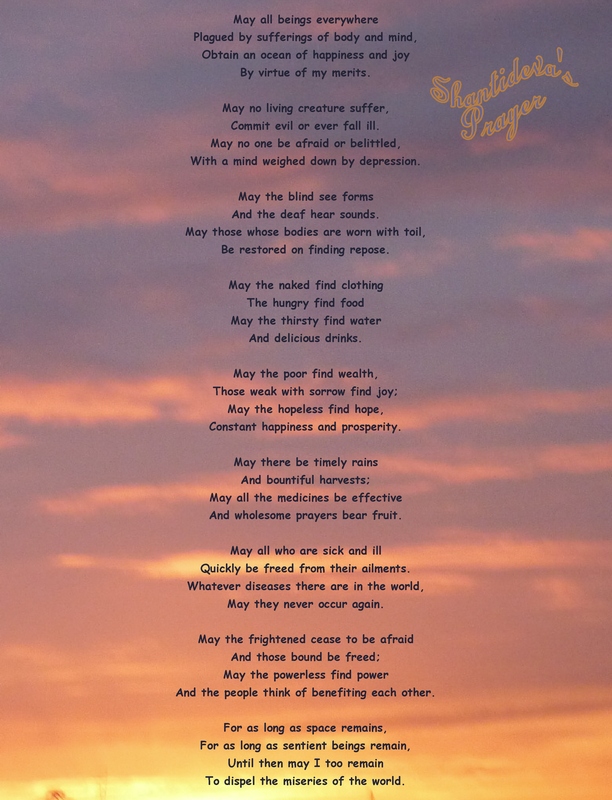 It’s a poem our school children should all learn. yes, I think it’s beautiful too… and wouldn’t it be something if children were introduced to more awareness of these sentiments.